There’s only one place I want to go and it’s to all the places I’ve never been. 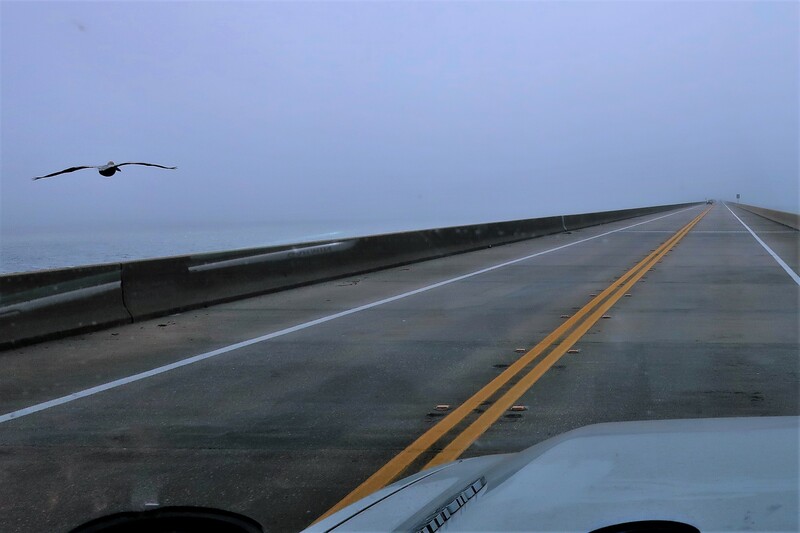 Sunday, February 17, 2019: Woke to foggy and cool weather off the Texas Gulf Coast and prepared to leave Corpus Christi Naval Air Station. Departed under clearing skies at 1000 hours and meandered through the countryside toward the northeast intersecting I-10 an hour later. An uneventful transit, with a few rest stops, before pulling into Beaumont, Texas and seeking a recommended RV Park for the evening. 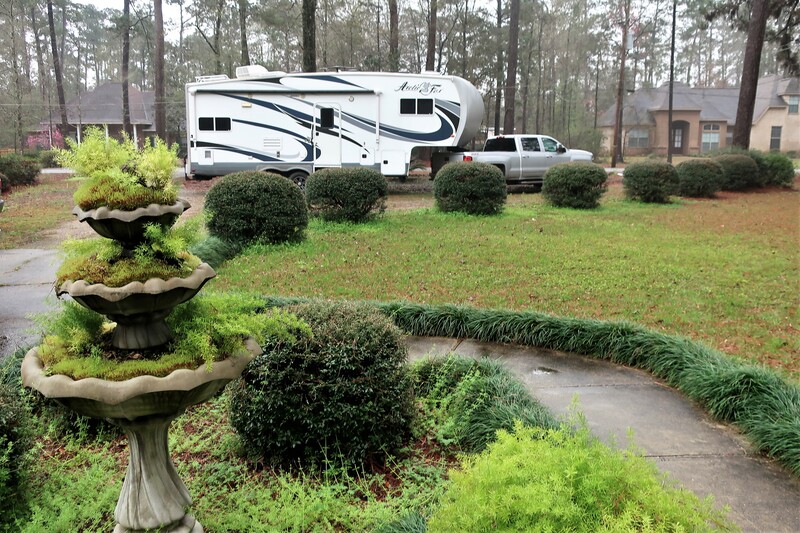 Gulf Coast RV is a nice and well managed campground…the overnight sites are a bit tight but nice and long. 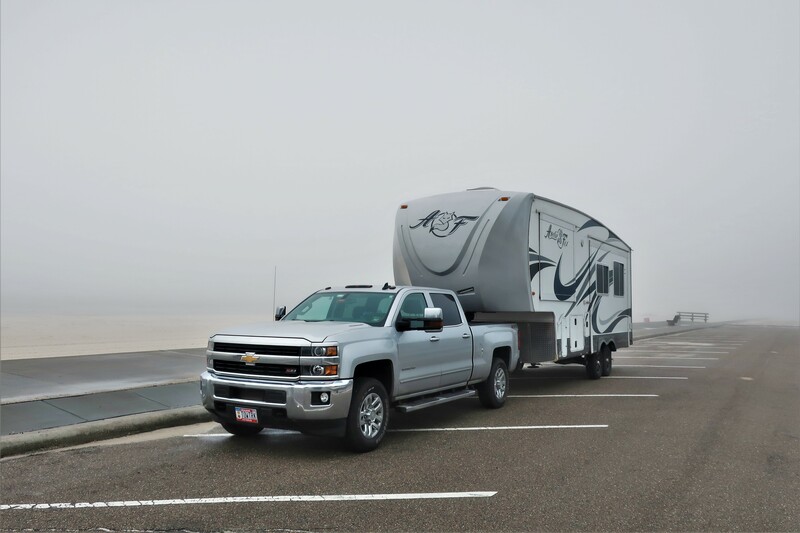 Our rig is only 45 feet long in total…however, a number of newer fifth wheel trailers and their tow vehicles exceed 60 feet which makes some parks rather restrictive due to lot size…this was not one of them. Entering the camper after six and a half hours of riding on some of the more poorly maintained roadways on our nations interstate highway system, we encountered this! 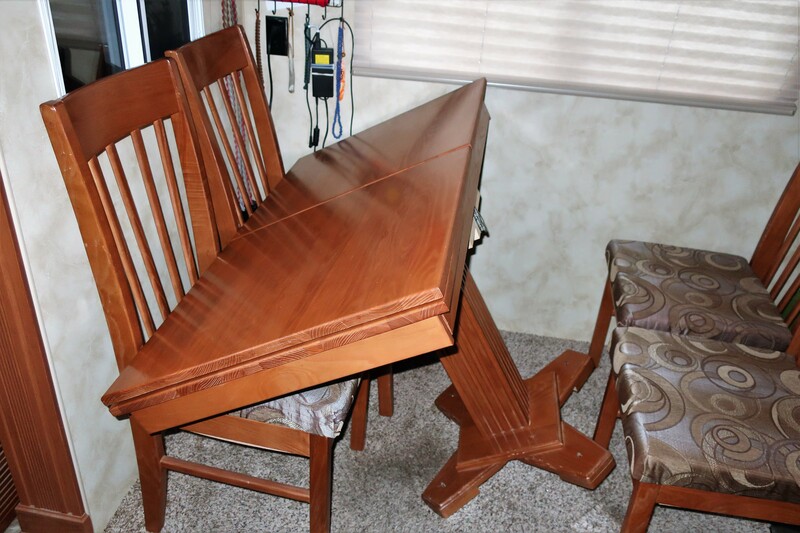 That table is supposed to be upright and held in place by rather large fasteners…however, the screws stripped right out of the floor and the table toppled!?!? No harm, just righted the thing and used even larger screws from my inventory of miscellaneous hardware to fix the problem! 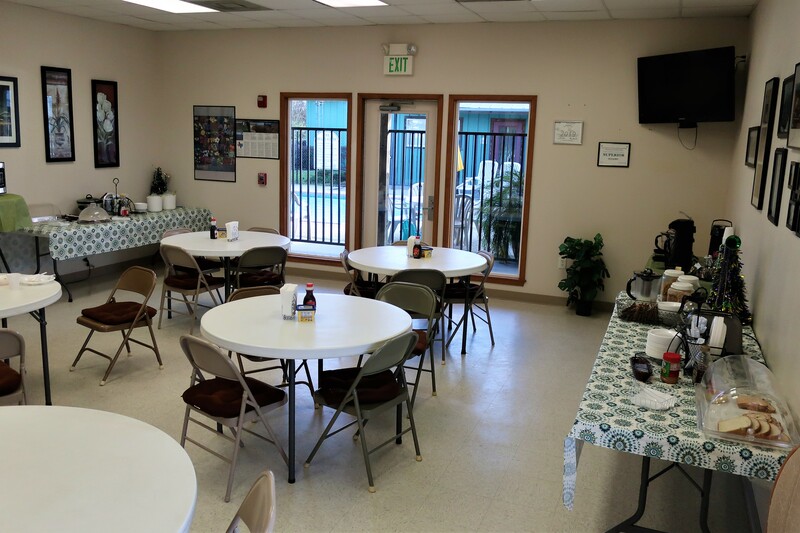 Sunday, February 17, 2019: Woke early and after some e-time we strolled down to the office complex for a nice continental breakfast…a complimentary feature unusual in the average campground! 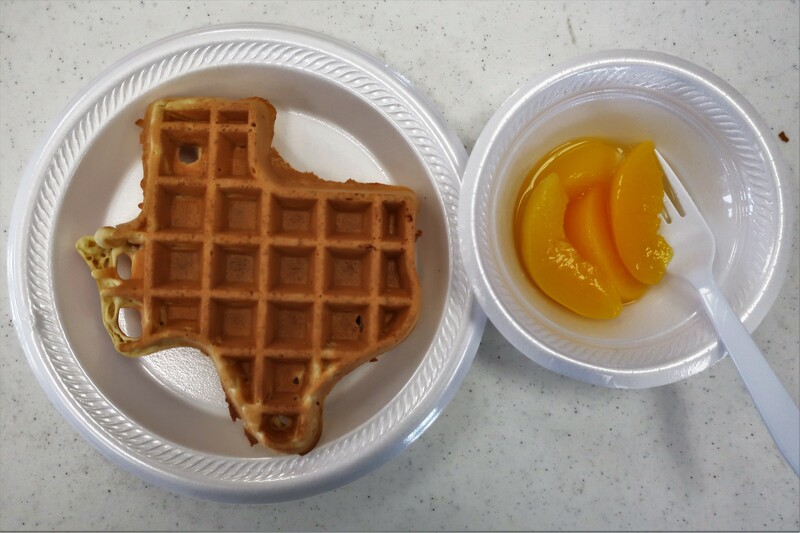 And, Texas being Texas, the variety and quantity were quite large…and, as an added touch, the waffles were formed in a distinctive shape. Following the hearty and delicious breakfast, Kit and I got underway at 1016 hours and hopped back on Interstate-10 heading east under partly cloudy skies and a temperature of 54 degrees. …and stopped at their very nice and informative Visitors Center for a break. The Atchafalaya Basin, the largest wetland in the United States, is a swampy area we have cruised over many times in the past. 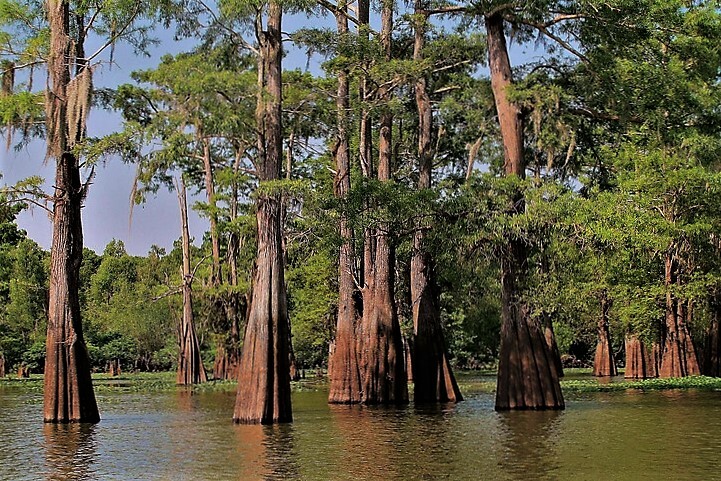 Historically, there were a dozen communities in this area engaged in hunting, trapping, fishing and logging the Tupelo-Cypress swamp forest. The frequent floods combined with depression era flood control projects, forced the residents to move onto higher ground and the swamp slowly reclaimed their former homes. 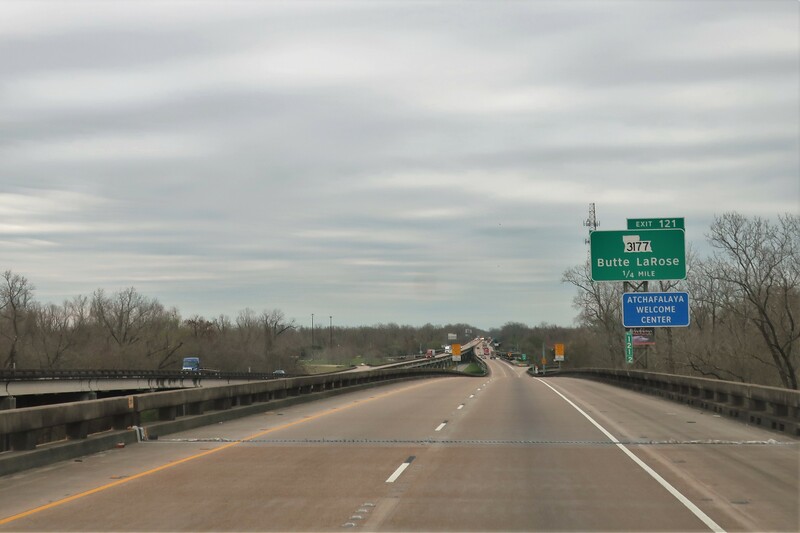 At 1609 hours we crossed the Mississippi River at Baton Rouge, and thirty minutes later exited onto I-12 to skirt the northern shore of Lake Pontchartrain. Within an hour, we arrived at the Covington, Louisiana home of our longtime friends from the Key West days, Johnnie and Eileen. It’s always a treat to visit these old friends and accept their hospitality of setting up camp in their spacious circular driveway. Following a nice meal, and great conversation, it was time to call it a night. Tuesday, February 19 and Wednesday, February 20, 2019-Covington, Louisiana: We have visited these pleasant folks many times over the past eleven years of our Excellent Adventure trips, and have seen most of the regional sights, so this stop was all about getting caught up on our lives and enjoying each other’s company. 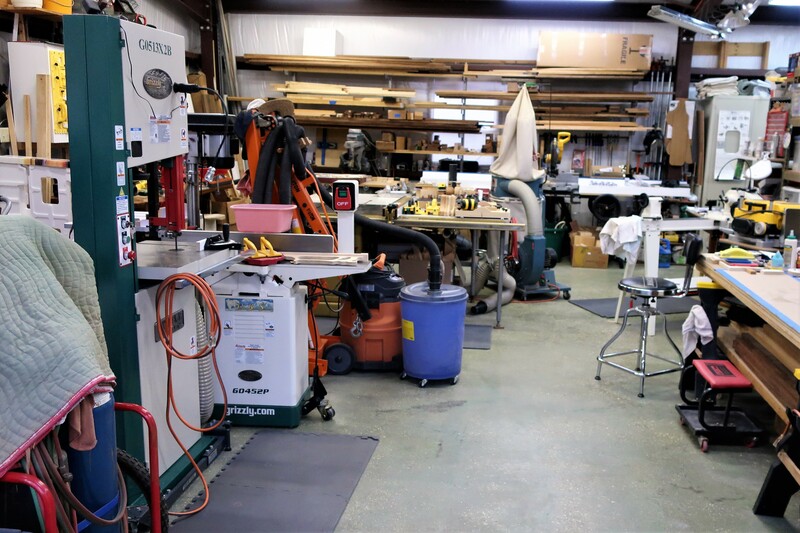 Kit and Eileen have many hobbies in common as do Johnnie and I…while the ladies visit in the house, we head to Johnnies well appointed woodworking shop to, well…talk shop! 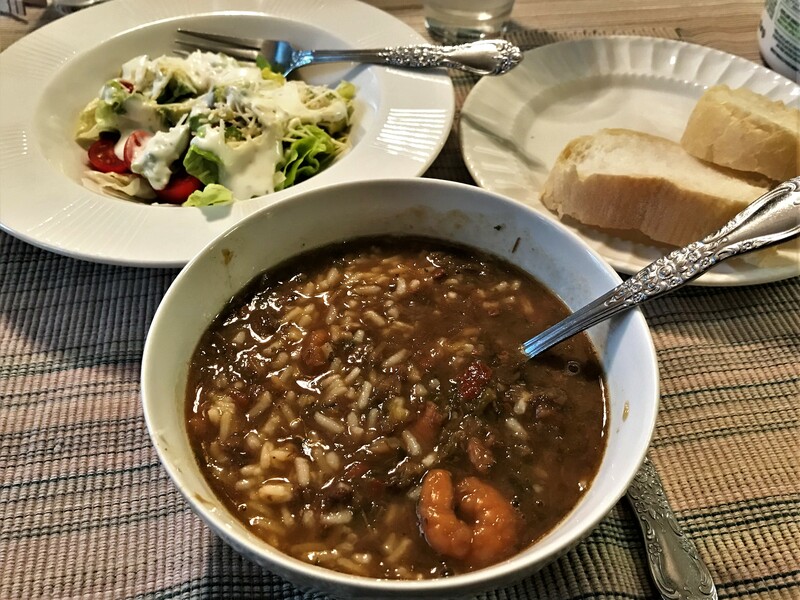 Another hobby we share is eating good Cajun food such as the Shrimp Gumbo that Eileen prepared one evening. The dinner, as well as the company, was incredible! 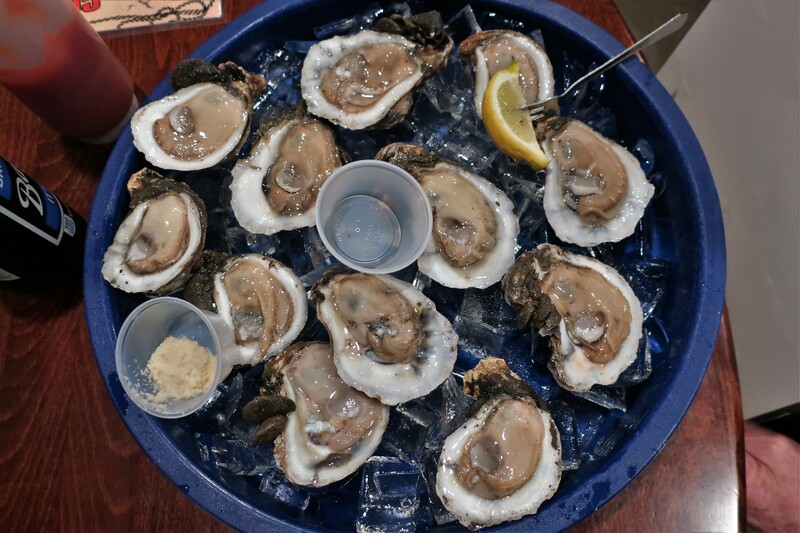 …they can’t be beat for quality, taste and texture! 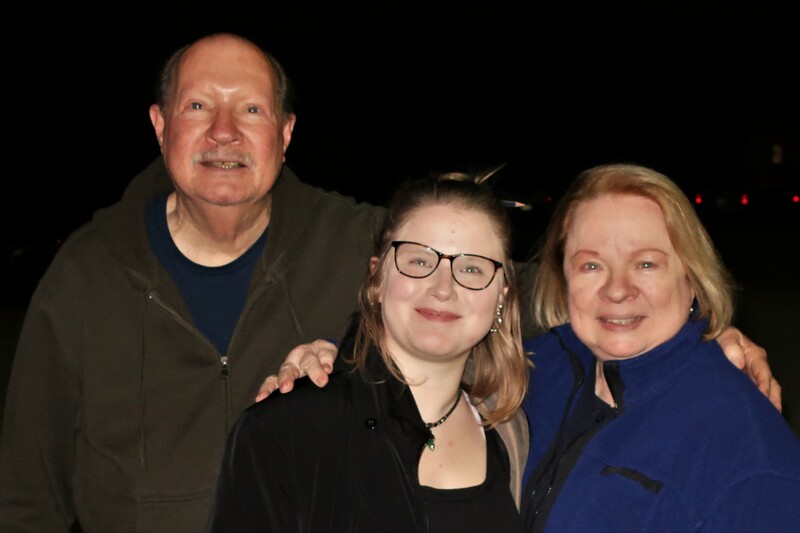 On this particular occasion, we were joined by their delightful granddaughter Shelby, a high school senior with a developing art talent. Kit and I had a great time folks, thanks again for spending part of your week with us! 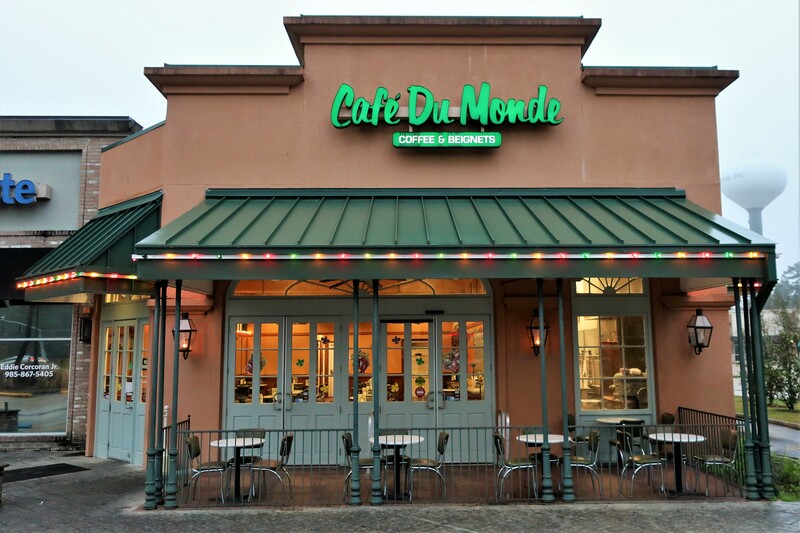 …an outpost of the original in NOLA’s French Quarter, Café Du Monde (french for The Peoples Café) features the perfect morning elixir…Chicory Coffee! And the freshly baked Beignet’s pair nicely as well! Well fed, and fortified, we eased onto I-12 and headed east. 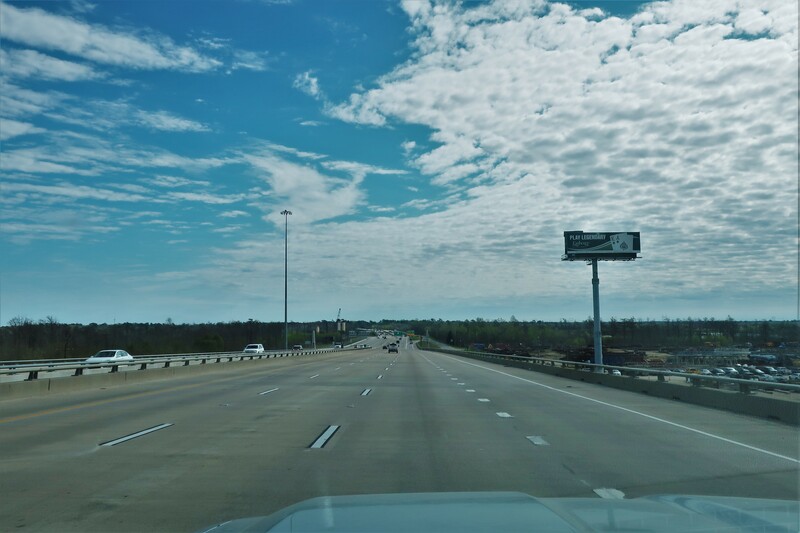 Since we left so early, and have no particular destination in mind, Kit and I decided to move over to US-90, which parallels I-10. This is a more scenic, albeit slower, route toward the East. Crossed into Mississippi at 1005 hours and encountered a thick fogbank as we neared the coast. Decided to pull over at an oceanside parking area in Gulfport, Mississippi to wait out the fog and figure out where we may want to spend the evening. Well, you’ll have to take it from me…about fifty yards from our parking spot lies the Gulf of Mexico, but the fog is so heavy it’s hard to tell. 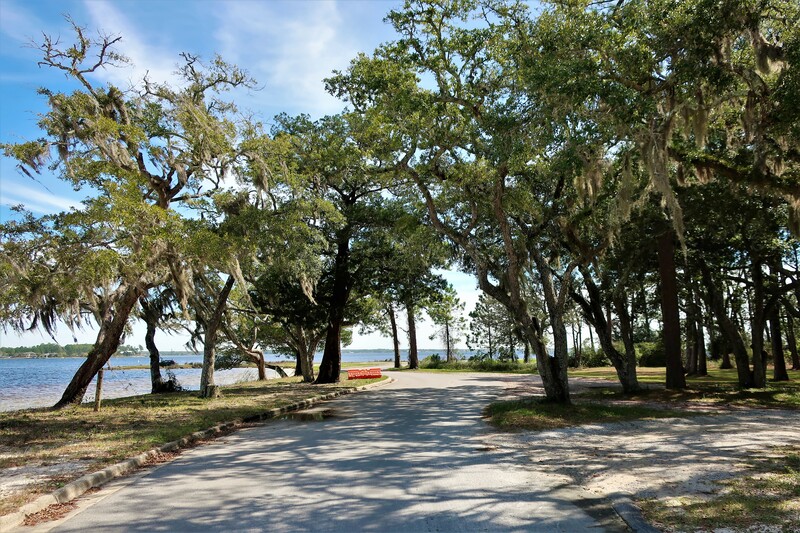 There were camping opportunities at both Gulfport Naval Station and Kessler Air Force Base, but since it seemed a bit early to stop, and since we’ve spent time at both places on previous trips, and since I had made numerous business trips to nearby Pascagoula, we decided to roll on. Moved back to I-10 East just east of Ocean Springs before crossing into Alabama at 1146 hours and abruptly came to an all stop as we neared Mobile. Traffic near large cities is usually heavy, but this was extreme. 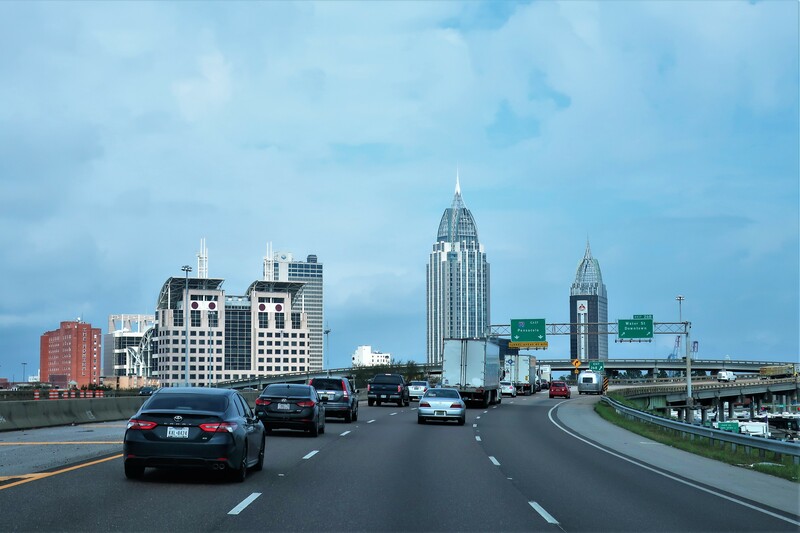 We inched along in the travel lane as I-10 dipped into the 3,000 foot-long George Wallace Tunnel under the Mobile Bay. 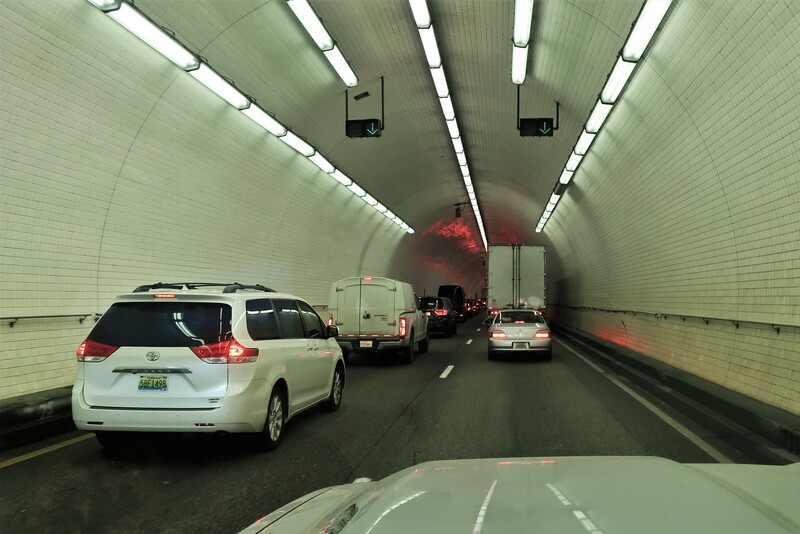 Ventilation in this 3,000 foot-long tunnel is normally very good…at 60 MPH. However, at 2 MPH it was beginning to get a bit fumy, so I shifted the trucks AC to recirculation mode and the cabin air freshened. Slowly emerging from the east end of the tunnel we noticed traffic was merging into a single travel lane and so we did likewise. Shortly, we learned why everything was so backed up on I-10. I’m guessing the Community Coffee delivery driver had not had his coffee today! 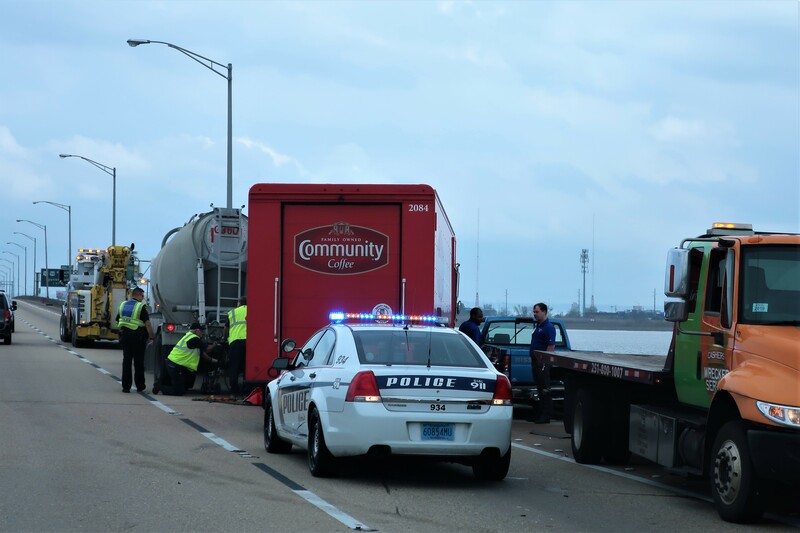 Hidden from view between the box truck and the cement truck, where emergency personnel are working in the photo above, was a small sedan…and the blue compact pickup wedged between the box truck and bridge wall was involved as well. The good news was that apparently everyone was OK and none of the vehicles plunged into Mobile Bay. At 1347 we crossed over into Florida and pulled into the welcome center for our complimentary orange juice and some maps. 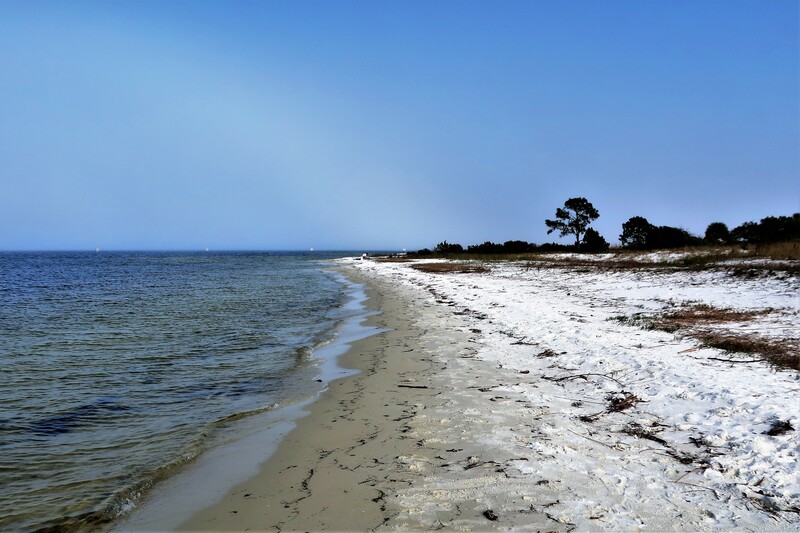 A quick “Bill and Kit” planning session resulted in us bypassing Pensacola, a spot we’ve camped at many times in the past, in favor of heading to Eglin Air Force Base located on the Emerald Coast, as it is called, near the town of Destin. 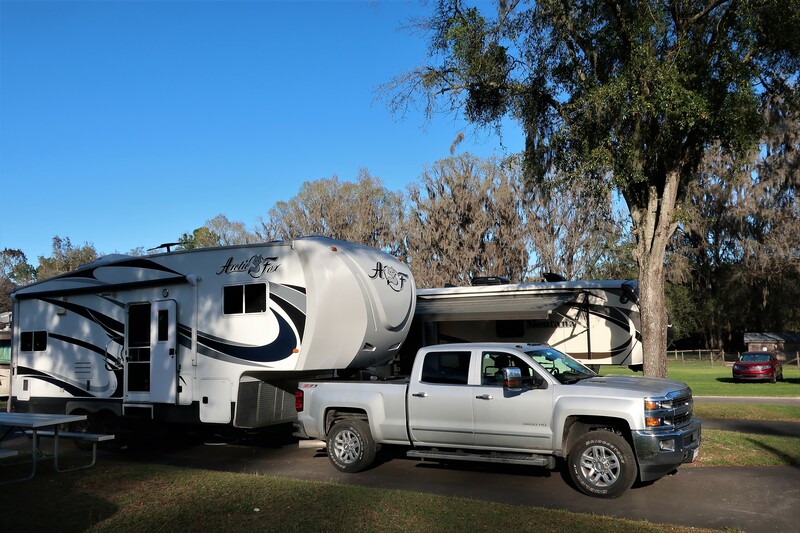 Pulling on base, we discovered that we could only score four nights due to the extra personnel staying in the campground due to the evacuation of Tyndall AFB which was heavily damaged during Hurricane Michael. Much to our delight that one camp spot was in the more rustic of the two parks’ where the environment was much more to our liking. Lacking many of the amenities of the newer campground, Post’l Point offered much more by its incredible location. Setting up camp at the end of the point, we enjoyed a commanding view of Choctawhatchee Bay and the barrier island town of Destin in the distance. And to add frosting to the cake…we were treated to a gorgeous sunset! Friday, February 22 through Sunday, February 24, 2019-Eglin AFB, Valparaiso, Florida: Woke early to birds singing outside our window. As spectacular as last nights sunset was, this mornings sunrise across the small bay bordering the north side of the campground, was equally as pleasant! The weather today is projected to be partly cloudy with temperatures in the low 70’s…my personal threshold for the wearing of shorts. This is our first venture into this region of Florida. Generally, Kit and I are on a mission to get out West and so only touch the Pensacola portion of the state. So…this trip we are taking the opportunity to see as much of the Emerald Coast as possible. 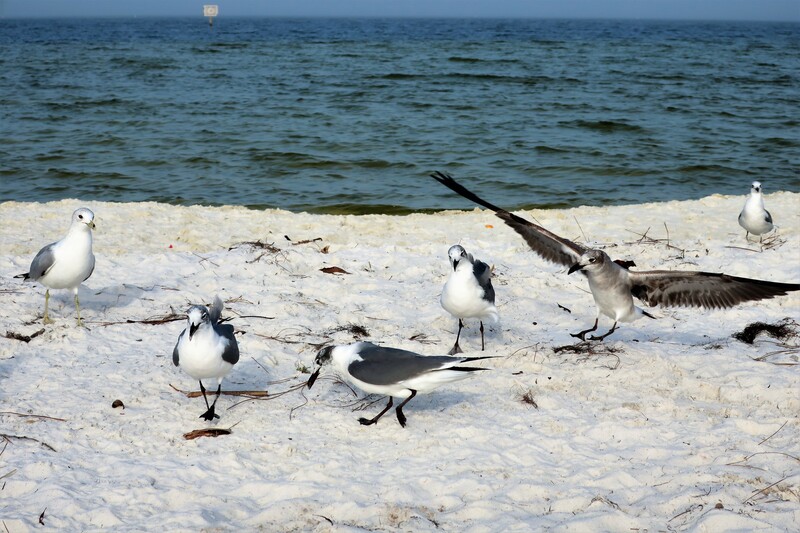 …and in route, a seagull challenged me to a race…and won! At the far end of the bridge was a large boatyard that was painted in colorful undersea scenes. Murals such as this are scattered about the country and are the product of a very talented and prolific artist by the name of Robert Wyland. Born in landlocked Madison Heights, Michigan, a fourteen-year-old Wyland viewed his first ocean on a family vacation along the California Coast. He was infatuated with the sea and its sea life which focused his burgeoning art talent toward ocean themes. 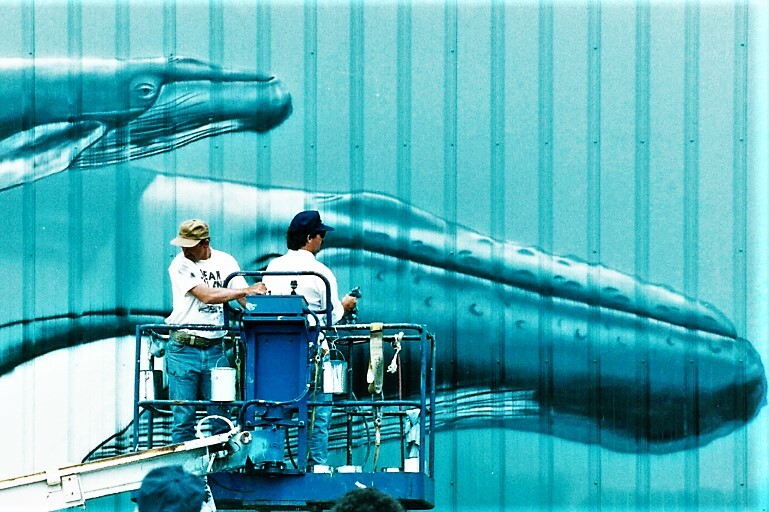 Wyland has designed and created one hundred of these murals starting in July 1981 with a small painting of a Grey Whale and Calf in his adopted hometown of Laguna, California…designated as Whaling Wall #1. The painting in the above photo on Florida’s coastal town of Destin is Whaling Wall #88 and is titled…Marine Life off the Gulf Coast. 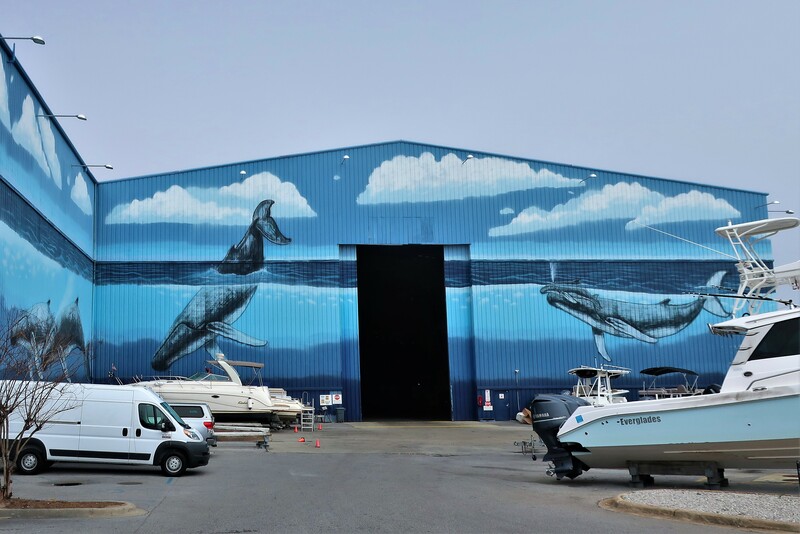 Portland Maine was the grateful recipient of Whaling Wall #36 in June 1993, which was painted on the exterior surface of a Bath Iron Works Shipyard Building along Portland’s iconic Commercial Street and is titled Whales off the Coast of Maine. His final mural, Whaling Wall #100, was painted in Beijing, China in June 2008 and is titled…Hands Across the Ocean. 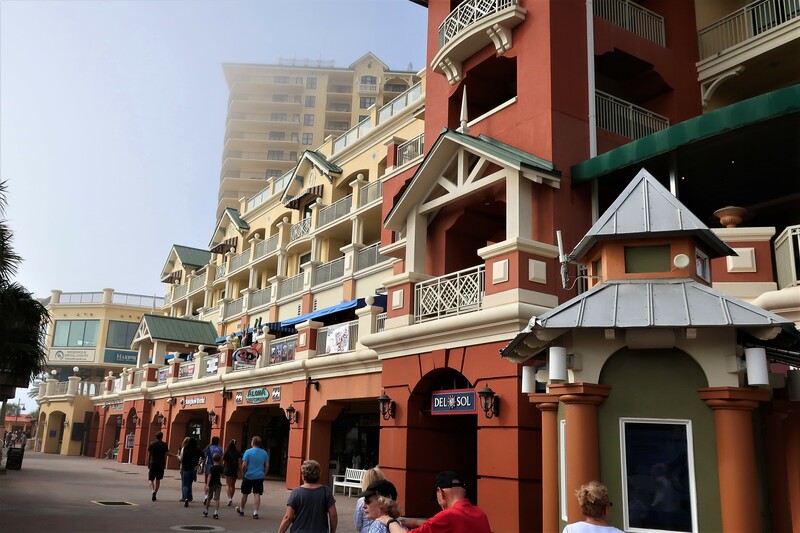 Destin is set up as the typical beachside tourist town with shops, restaurants, street musicians, and pale northerners strolling down the manufactured promenade. 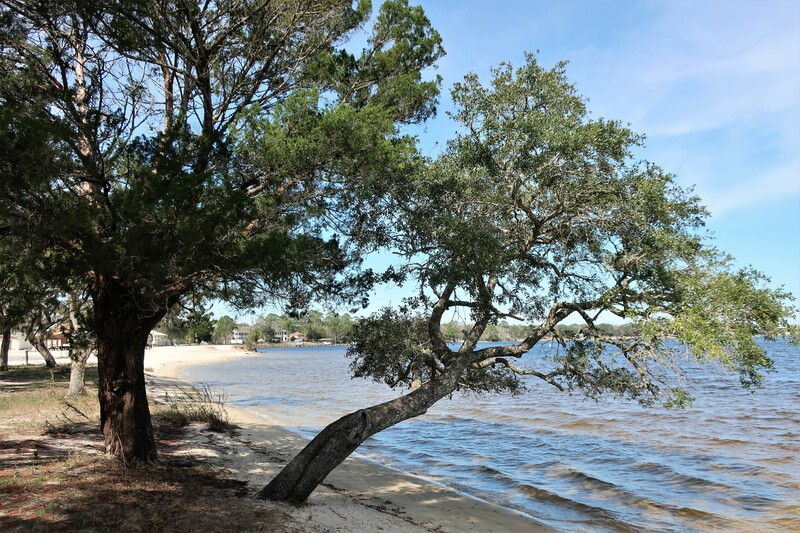 The town was once a sleepy little fishing village, and along its waterfront there was a magnificent tree that served as an early navigation aid to fisherman returning to port. The 170-year-old Magnolia finally succumbed to the ravages of time, storms and man. Rather than uproot the deceased tree, it was decided to memorialize it in sculpture. 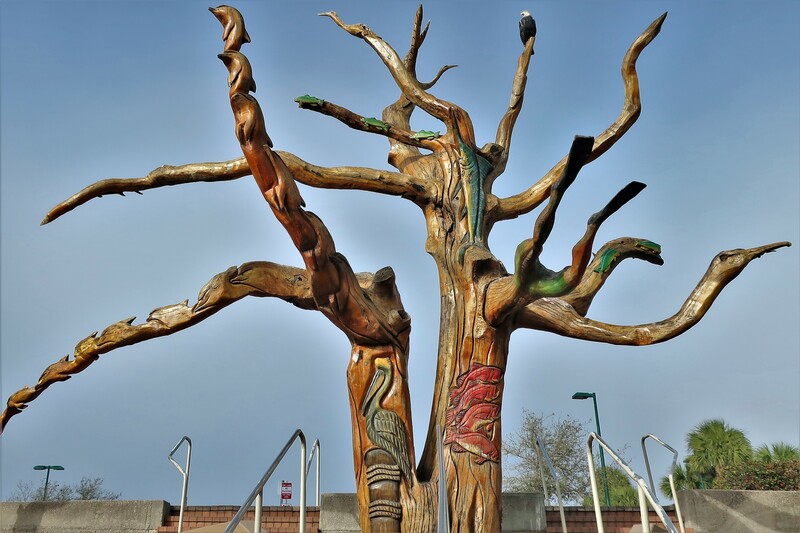 In 2014, famed artist Marlin Miller who is nationally recognized for creating similar public works of art, was contracted to design and sculpt the tree into images depicting Destin’s marine heritage, including sea life, aquatic birds, and even the legs of a flippered diver. …then one politician, losing the battle of wits, flapped about and soiled the area before flying off to attend a fundraiser. See, one can find the absurdity in today’s dysfunctional government in the most benign subjects. …which was very good and didn’t taste a thing like chicken! Of our three day stay, Kit and I only made one trip off the reservation because our campsite was so relaxing. 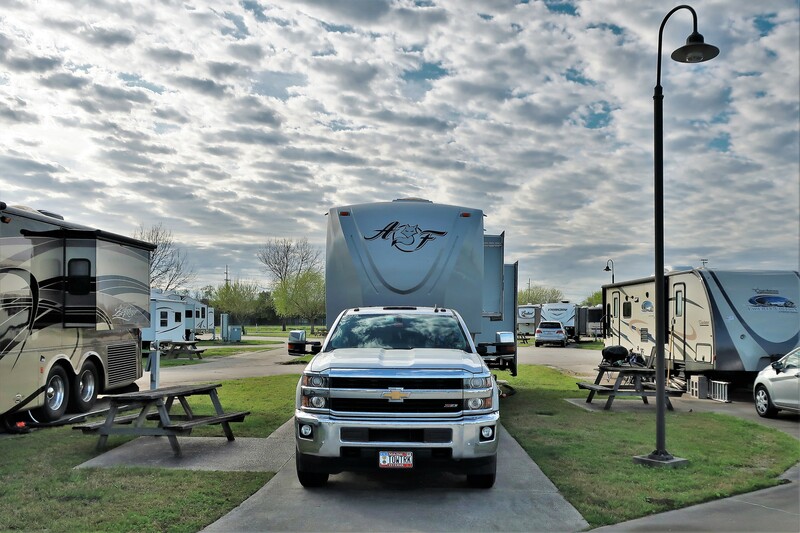 As mentioned, Eglin AFB has two campgrounds…a newer facility with more modern facilities, and the one we are staying at that features a great location but lacks full hook-ups, and other conveniences of the typical RV park. But you can’t beat the location and views! 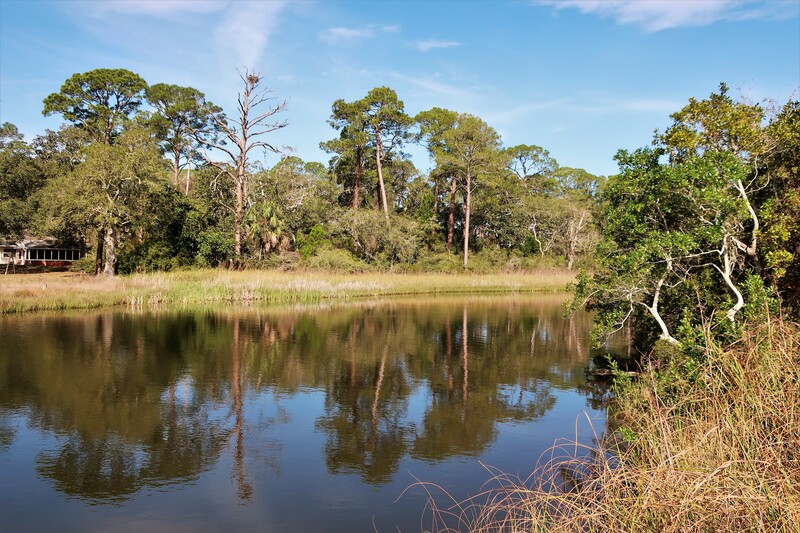 The campground sits on a small peninsula with a saltwater pond teaming with life on one side. Yep, that’s a nesting eagle in the tall dead tree top! And on the other side is a nice clean white sand beach…known locally as Sugar Sand! This sand is powdery fine, unlike the more course sand on our native California beaches, or the pebbly sand in our adopted state of Maine. … are native wild animals that are much higher on the food chain than little Muffy. 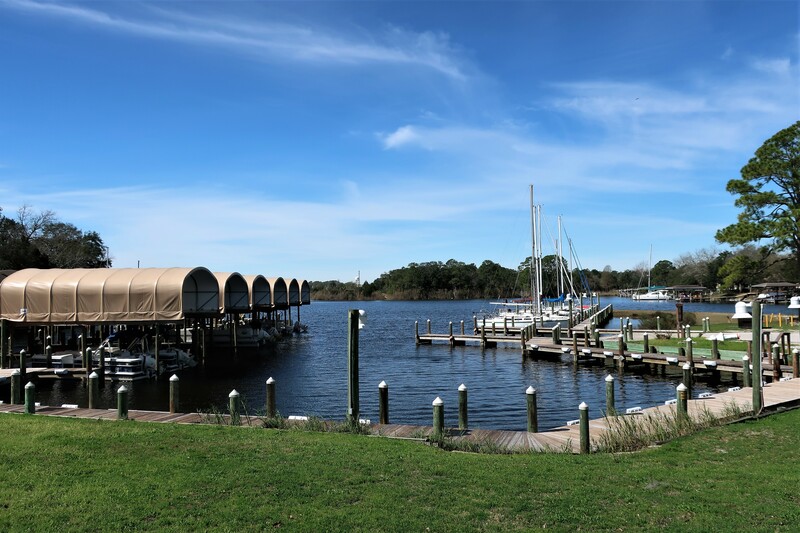 …where paddle, power and sailing craft are available for rent. Kit and I have noticed throughout the years that campers take on the personality of the campground they prefer, or visa versa. On one hand, Resort type facilities tend to attract the upper crust who generally do not socialize much outside their million dollar rolling estates. On the other hand, more rustic campgrounds tend to attract the more laid back and friendly folks. 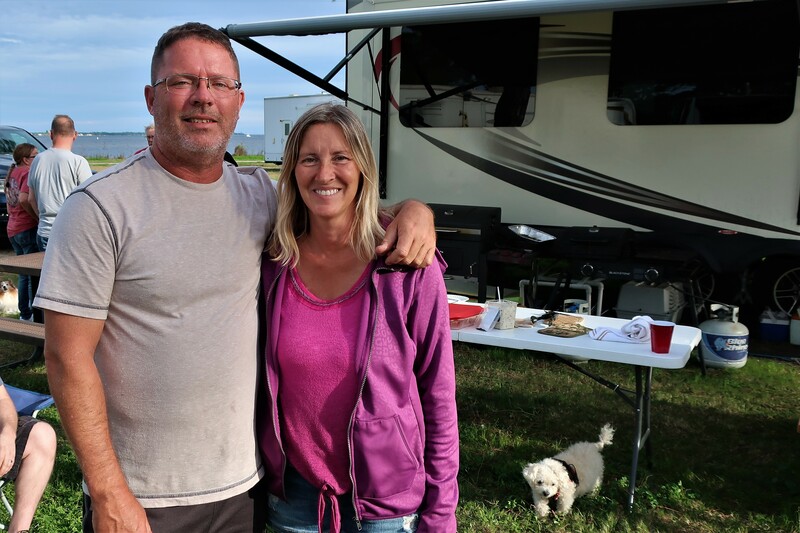 On the third hand, there are vagabonds such as us that pull their gypsy wagons in whatever direction their mood strikes them…this campground had some of the later such as Willie and Karen. The recently retired couple invited most of the small campground’s inhabitants to a chicken barbeque at their camper. We had a great time meeting other ne’er-do-well folks and sharing stories from the road…some of them actually based in reality. 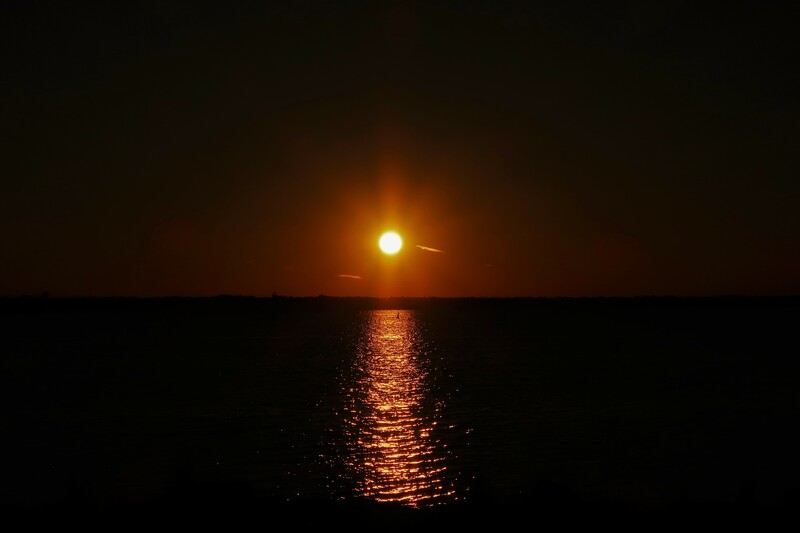 As the evening came to a close, and the sun set across the bay, Kit and I joined the remaining campground scalawags and raised a cocktail to another fabulous day in Florida. 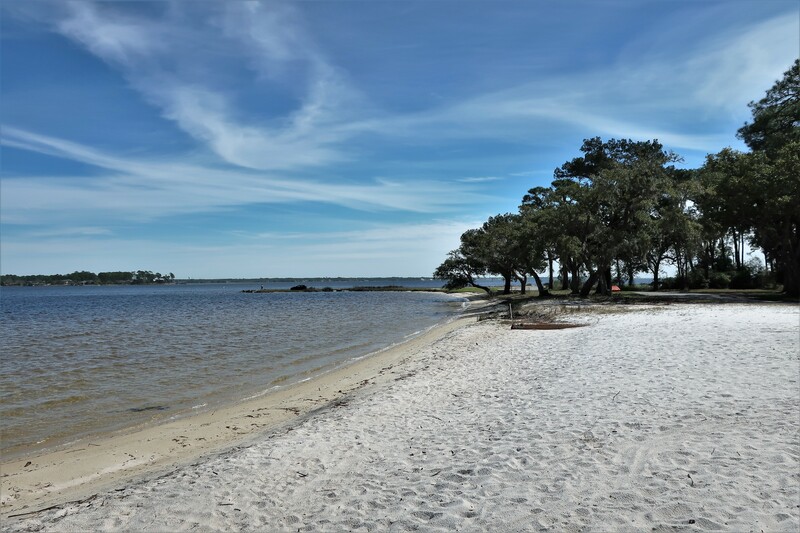 Monday, February 25, 2019: Underway from Post’l Point Campground on Eglin AFB at 0955 hours under sunny skies and a temperature of 56 degrees. 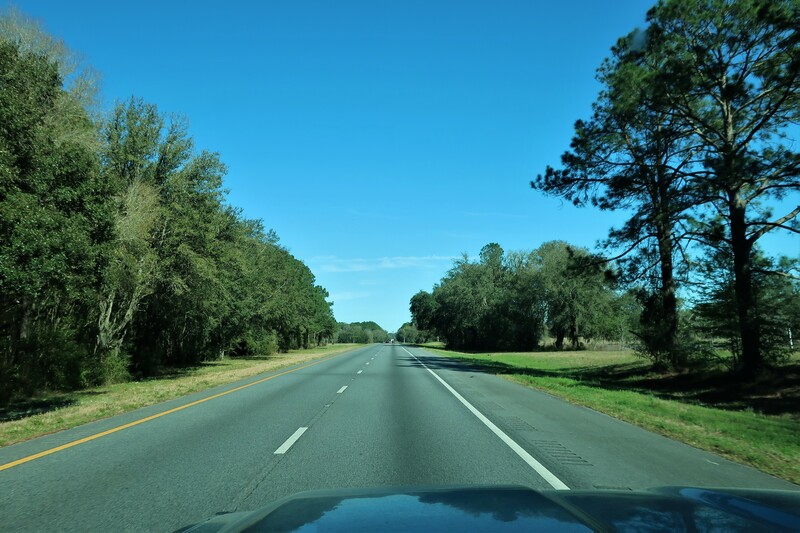 Made our way using the local roads of the Florida Panhandle toward Interstate 10, which we utilized to continue toward the east. 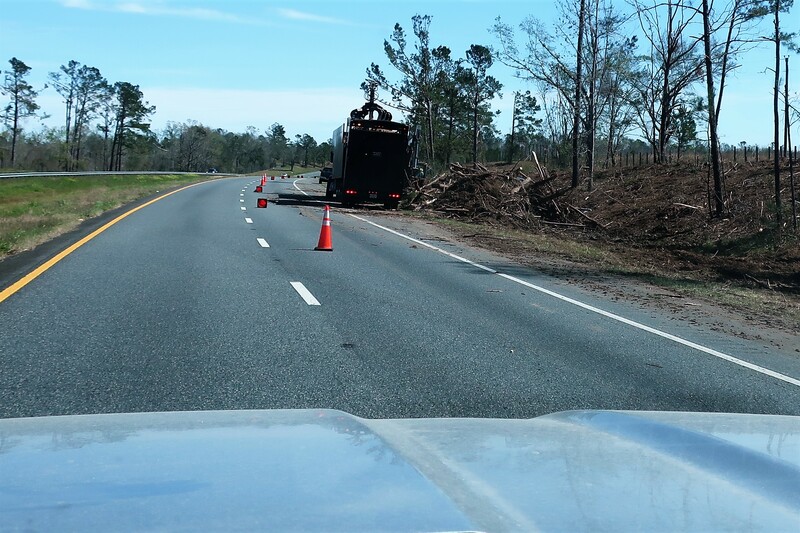 Along the highway, we witnessed several areas still recovering from the ravages of Hurricane Michael in October of 2018. At 1204 we crossed back into the Eastern Time Zone and lost an hour of the day. Four hours later we encountered Interstate 75, the former Sunshine State Parkway, and headed south. As most of you know, we don’t plan our travels too far in advance, and a few weeks ago had no intention of diving south into Florida. 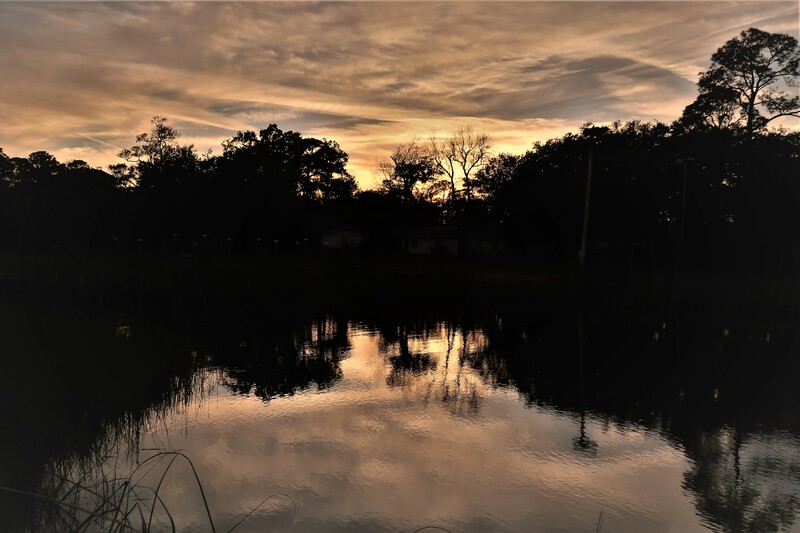 However, the cooler than normal winter temperatures this year, coupled with the presence of some great friends that are wintering over in the Tampa area, attracted us to explore parts of this haven for winter refugees. 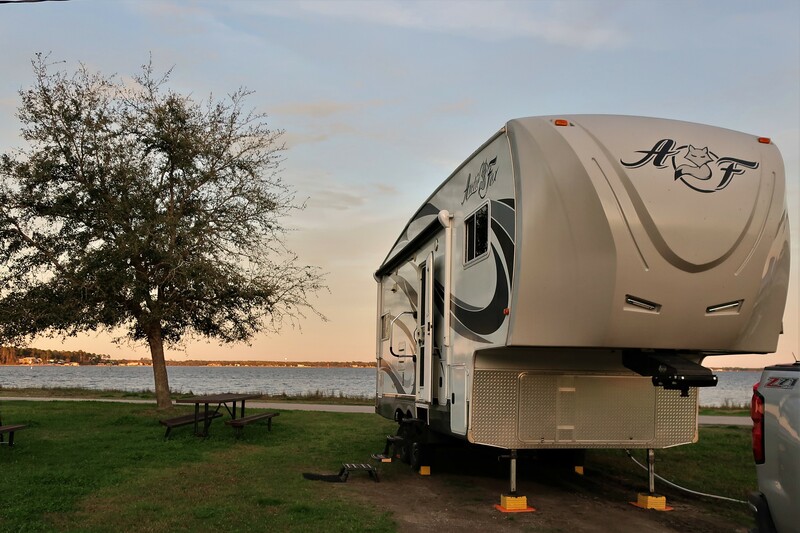 At 1547, it was time to seek shelter for the evening so pulled into Travelers RV Park in Alachua, Florida, which came highly recommended by fellow RV’rs. 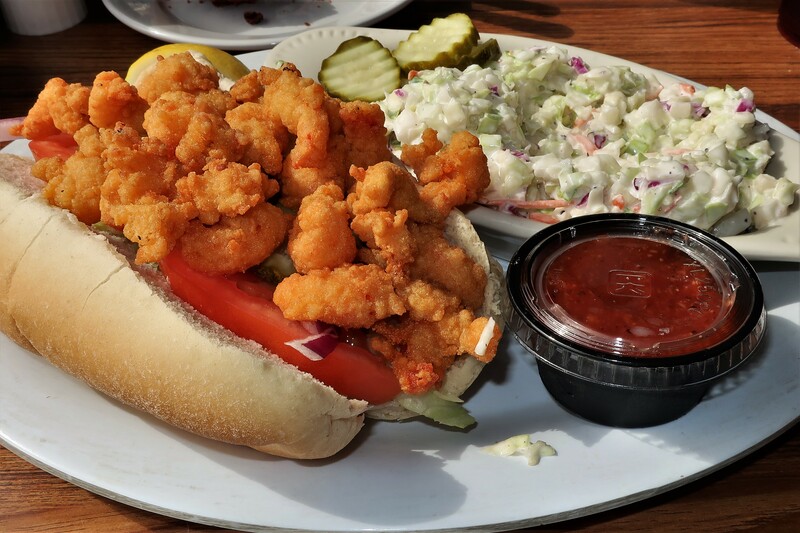 Well, this closes out the most recent chapter of Bill and Kit’s Excellent Adventure…stay tuned for Fun in the Sun with Maine Snowbirds, coming soon to an inbox near you…goodnight! Kit’s Bit’s: We have thoroughly enjoyed the last couple of weeks as we begin to explore a bit of Florida. Having more time as we wander about, has been quite nice. We haven’t had to rush to keep moving on quickly or to get home by a certain time. More time to spend exploring. One thing I’ve noticed is the green landscape vs pale green and brown landscape out west. Since I’m originally from Minnesota, I’ve always preferred green over brown. 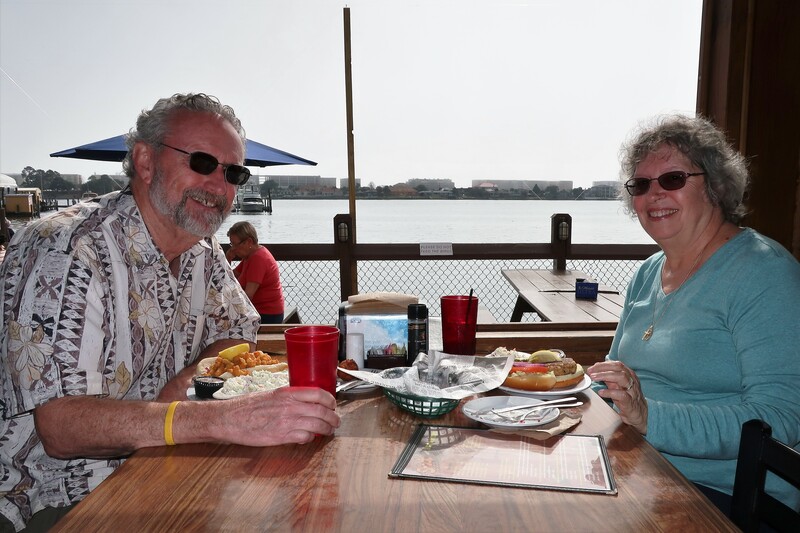 Chas and I had dear friends who lived in Destin way before it was as built up as it is now. We visited there several times and loved it. Across the bridge to ?? was a restaurant called Fudpuckers…had to eat there, of course…bought my brother a tee shirt that said ‘ you ain’t been pucked ’til you’ve been fudpucked!! Hi, thanks for leaving a comment on our website. We miss you, and all our Sage friends…be home soon! 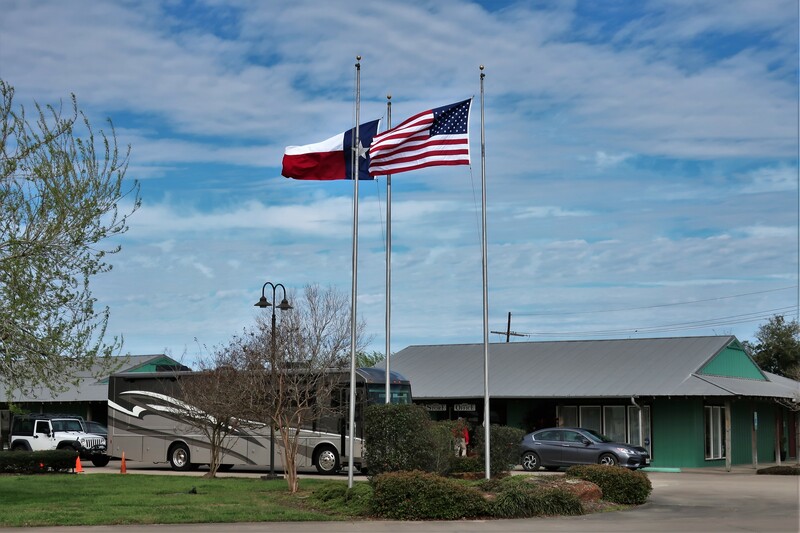 Beaumont TX….was the campground next to a fairground? We stayed in one there. Can’t remember the name, but it had a great complimentary breakfast with Texas-shaped waffles. Wonderful roomy campground. We were there during fair week. Glad you decided to spend some quality time in Florida this winter. We really enjoy our Florida winters. Hi Pat, the campground we stayed at was in a neighborhood…don’t remember seeing a fairground nearby. We enjoyed visiting Florida this year, in fact just yesterday Kit and I visited the state once again during an excursion. A question for Bill: Are some of those unFLAPpable politicians running for president? I fear that enough voters are GULLlible enough to vote for the candidates who squawk the loudest? A question for Kit: You are from Minnesota? I thought it was San Diego? Hi Jym, those flighty candidates couldn’t do any worse in congress than the birdbrain politicians we are stuck with. Addressing the birther issue, Kit was born in Minnesota, and I in The Territory of Hawaii…however, we were both raised in San Diego. I’ve seen that Wyland mural on Commercial Street but never knew the story behind it….what a talented designer/artist. 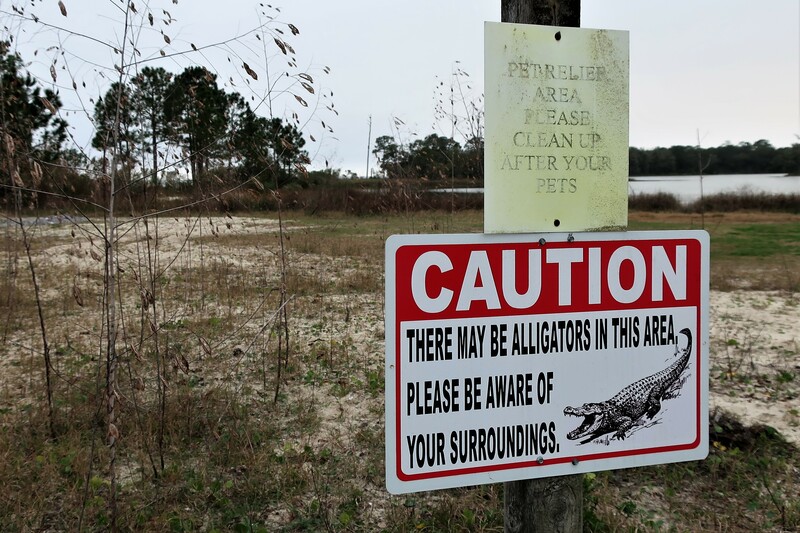 …Hopefully those gators weren’t too curious…or too hungry!! Hi Nancy, Kit and I lived in Florida back in the 1960’s and remember it fondly…however, as with most places it has evolved. So it was fun spending time in the state to experience the more modern, albeit a bit more congested, Florida and discovering how much it had changed. 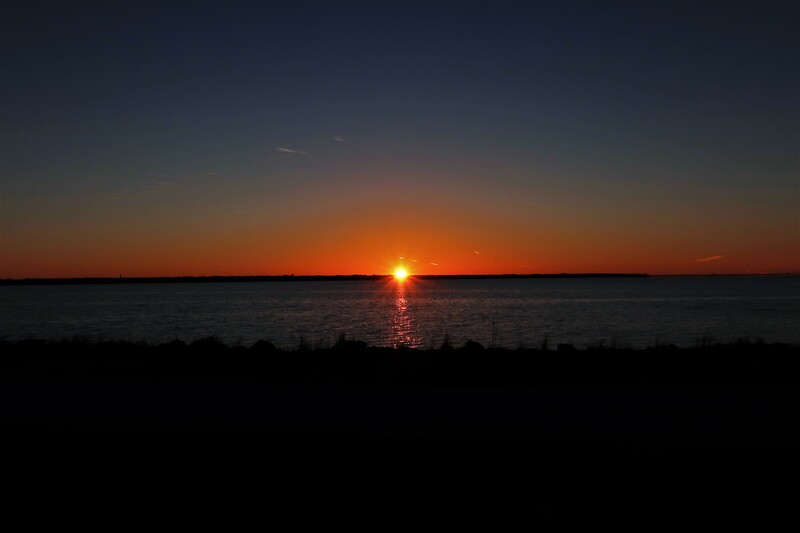 And, yes…the sunsets certainly do rival those in the desert southwest or on the California coast. HEY!! FINALLY SOME WARM TEMPS IN SUNNY FLORIDA. JEANNES FRIEND LINDA KRIDER AN EX AEGIS EMPLOYEE MARRIED A GUY FROM DESTIN. 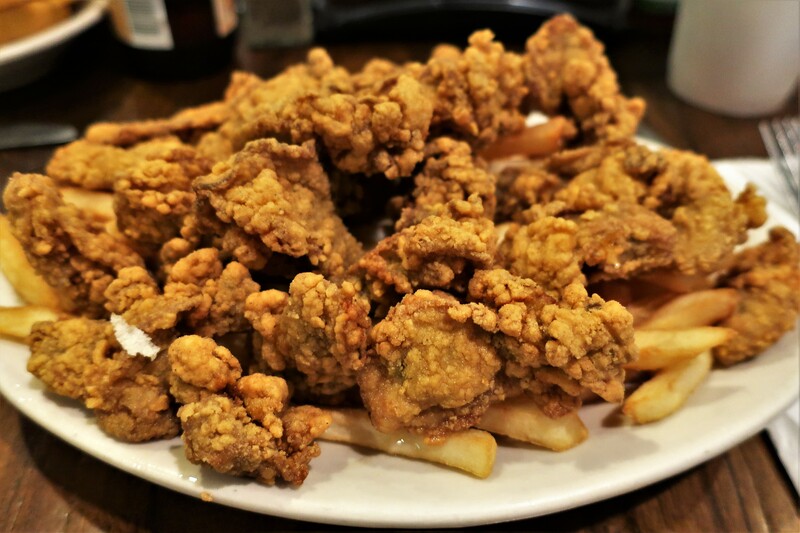 THOSE OYSTERS BOTH RAW AND FRIED LOOKED SOME SCRUMCIOUS! SPRING HAS SPRUNG HERE, IN THE MID 40S TODAY AND THE BAY IS STARTING TO BREAK UP. WE ESTIMATE ICE OUT TO BE MID APRIL. NANCY SAID THAT YOU PLAN ON DELAYING YOUR RETURN NORTH. WE’LL HAVE DINNER WITH THE GANG WHEN THAT HAPPENS!! BE SAFE AND WE’LL LOOK FORWARD TO #8. Hi Chet, I remember Linda Krider and the fellow she married…wonder what happened to them? We are slowly heading home, looking forward to seeing you guys, and the rest of the gang, soon! Great photos — and such tempting meals. Denise and I arrived in Fl on Monday. We will be here one month. I already played golf and we joined our square dance friends — Red Bates’s plus dancers. Red Bates is 86 and still looks like a 68. 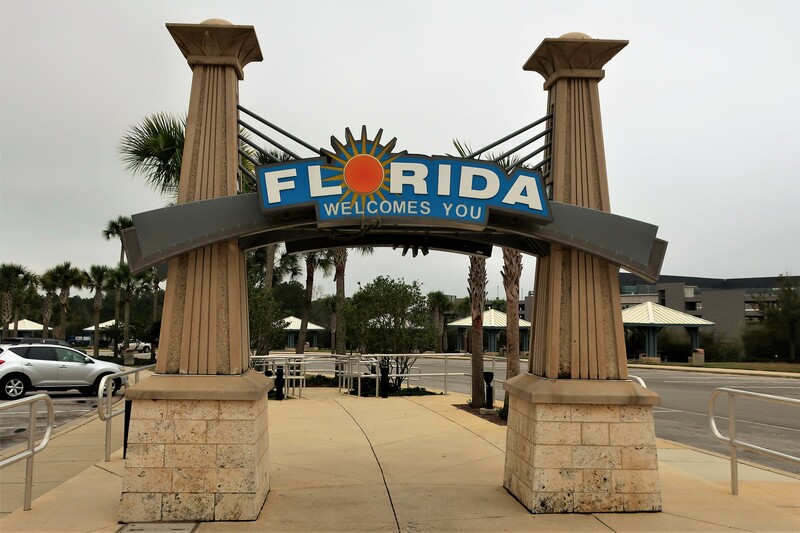 Hi Folks, welcome to Florida…sounds like you are having a great time! We are slowly migrating up the Eastern Seaboard and plan on arriving back in Maine early next month…hope to see you then!